SAN FRANCISCO — The biggest players in financial services technology right now might be Google and Facebook. That’s what it felt like at times at the Finovate Spring 2011 showcase last week at the San Francisco Design Center Concourse. 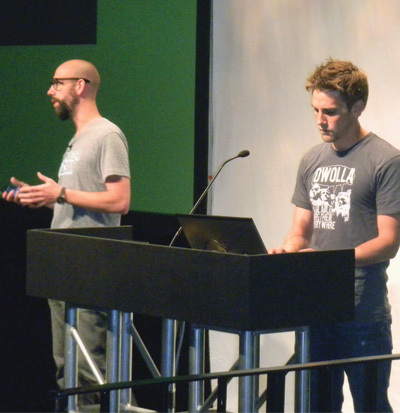 Dwolla founder Ben Milne and communications director Jordan Lampe during their seven-minute presentation at FinovateSpring 2011. SAN FRANCISCO — The biggest players in financial services technology right now might be Google and Facebook. That’s what it felt like at times at the FinovateSpring 2011 showcase last week at the San Francisco Design Center Concourse.